This article is part of the Bass Initiative on Innovation and Placemaking, a collaboration between PPS and the Brookings Institution. Nowadays, it seems that innovation districts are cropping up left and right. Urban and suburban leaders alike are attracted to these hubs, where people, resources, and institutions like universities cluster together. Innovation districts bear the promise of an economic boost, new jobs, and new solutions to old problems. But are they living up to their name? All too often, a focus on attracting tech companies and the millennial workforce distracts from the real potential of these districts, which lies in making better use of a city's existing assets, including current residents and businesses. As a result, many innovation districts become isolated physical and economic enclaves that fail to create a more inclusive economy or a public realm that connects, inspires, and incubates new ideas. Critical mass: Where are your region’s highest concentrations of “innovation assets”? Innovation capacity: Is the district leveraging and aligning its distinctive advantages to grow and strengthen its firms innovation capacity? 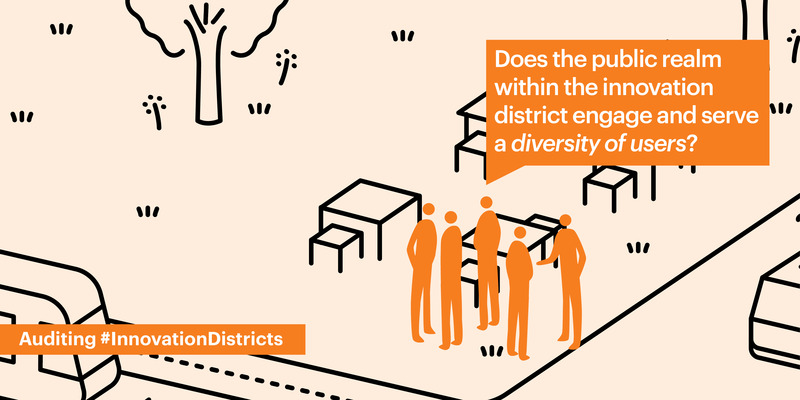 Diversity and inclusion: Does the district have an inclusive, diverse, and opportunity-rich environment? Quality of place: Does the district have physical and social assets that attract a diversity of firms and people, increase interactions, and accelerate innovative outcomes? Leadership: Does the district have the leadership necessary to succeed? The in-depth guide provides a framework for both qualitative and quantitative evaluations of an "innovation ecosystem,” mapping the assets that a place already has, and examining its capacity to grow. This exercise in auditing the strengths and weaknesses of a place covers all the ingredients of a successful innovation district; from inclusive hiring policies to a healthy start-up culture. It provides a first step on the road to an innovation district worthy of the name. Innovation—in the broadest sense—is trending for a reason. It can be what sets a place apart both economically and socially. A truly effective innovation district can be the difference between isolated industries, job markets, and research, and a more connected, inclusive, place-led economy. The first step to creating a great innovation district, and even a great place, is to take stock of what it has to offer in the first place.